M. Robert Goldman & Co. This regional construction company specializes in schools and colleges, health care facilities, and laboratories. We replaced their dated script logo with a bold I-beam of color. Standing out among the RFPs: bold graphic identity and proposal template distinctively brand Andron as an industry leader and have helped the company win new business in a larger geographic area. See-through letterforms give the logotype great flexibility. 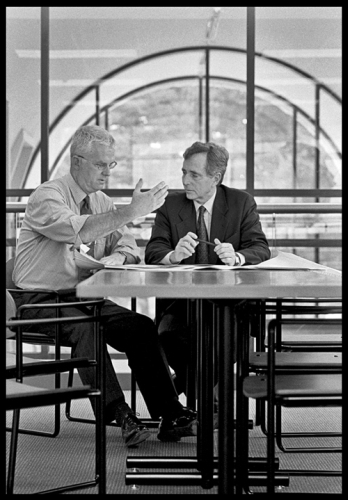 Portraits by Alan S. Orling depict Andron executives in intriguing architectural environments built by the company. 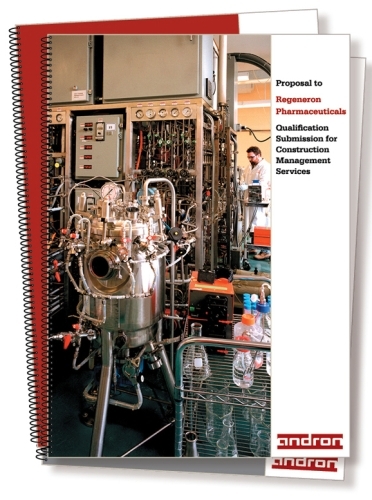 Proposal cover photography by ESTO in a complex Andron-built laboratory at Regeneron Pharmaceuticals, Tarrytown, NY.